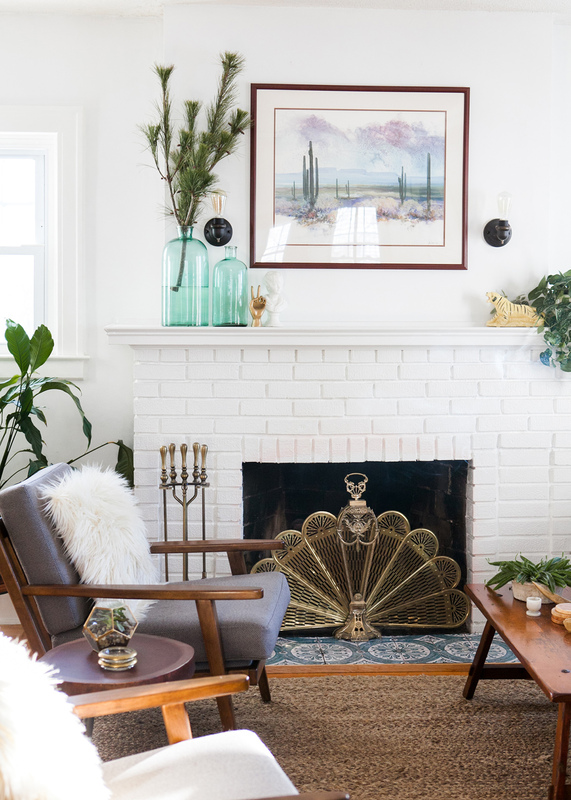 This DIY fireplace makeover is sponsored in part by StickPretty. All opinions expressed are my own. Well, StickPretty; she fix. That and a little bitta elbow grease to extinguish one of the Brigham Craftsman’s interior decorating crimes of the century. Not just the tile, but the noticeably visible gap of wretched sidetile hanging out over the quarter-round. Like tasteless sideboob. My goooodness. Let’s talk about StickPretty for a hot minute. Browsing the site, I was enamored at the vast collection of tile decals —it was a tough choice to make!! When I received the product, I was even more blown away. The high-resolution quality (which depicts wear-and-tear, too) looks REAL. In fact, my husband thought I had laid tile. How-ya-like-me-now?! 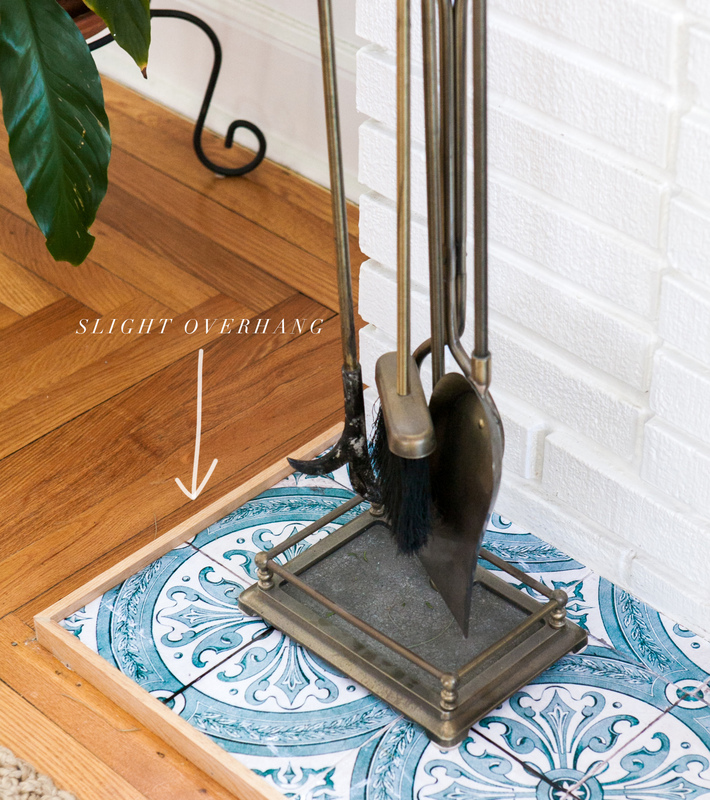 The shoddy tile installation led to cracks over time—a couple of quarter-sized gaps and loose pieces. I left the gaps alone and used a basic glue to hold the loose pieces in place. I removed the existing molding with a hammer, then vacuumed the area to remove all debris (and unwanted pet fur 🙈). This was SO EASY!!! The designs are printed on a high-gloss vinyl that peel on and off like buttaaah. The adhesive is user-friendly and very forgiving. I applied the decals with my bare hands, relocating them a handful of times until they lined up just right (on my particularly uneven tiles 😂). For the smaller cuts of tile, I used an x-acto knife, metal ruler, cutting mat and pen to make fitted cuts. The pen wiped right off! My extra added step: my hearth is uneven! I did not want to see the sidetile. I opted to cut my molding to the highest overhang. Since I couldn’t purchase molding 1⅛” high, I used a table saw to “rip” the wood to size. The wood is about a ¼ to ⅜” higher on the left side, but looks SO MUCH BETTER. Done is better than perfect. Say it with me!! Time to wood putty those nail holes! Once dried, I sanded the putty smooth. 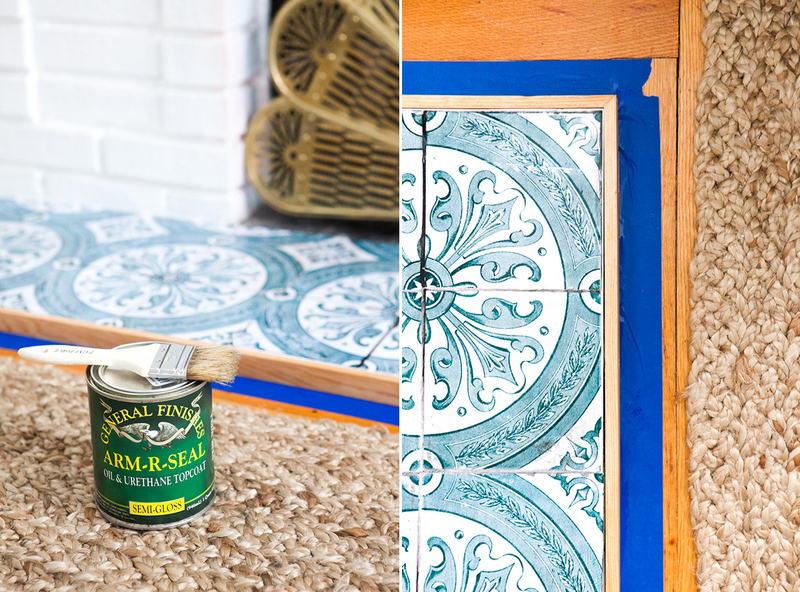 I taped along the hardwood floor and applied two coats of my preferred polyurethane. I recommend a light sanding in between each coat. Refer to the instructions for adequate drying time. 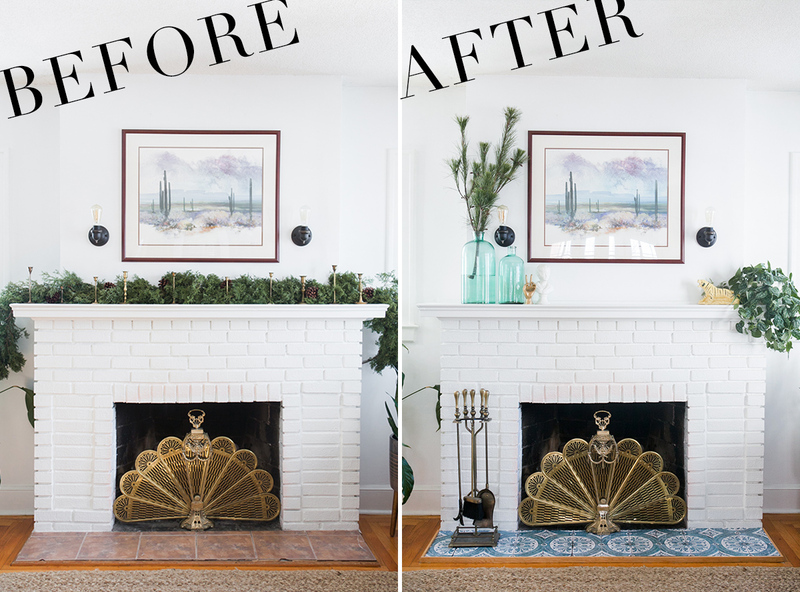 This DIY fireplace makeover took three to four hours to complete with a total cost: $55. Yep; you read right. FIFTY-FIVE BUCKS!!! You can’t beat that with a stick. A set of 10, custom 12” tile decals comes to $33 and the molding was approximately $20. Most of the time was spent replacing the molding. I’d say it took 30 to 40 minutes to install the decals. SO FRIGGIN’ QUICK!! This fireplace was a thorn in my side. Now, she’s a GODDAMN BEAUT. My original goal was to replace the hearth with freshly-poured concrete and/or new tile, but this DIY is so AWESOME it might be swaying me. We’ll find out in time. In time. StickPretty and I have teamed up to give the gift of $75 toward your next purchase!!! Hop on over to my Instagram – @imjessicabrigham – to enter to win! Giveaway runs until Friday, January 12, at 11:59PM Pacific Standard Time! 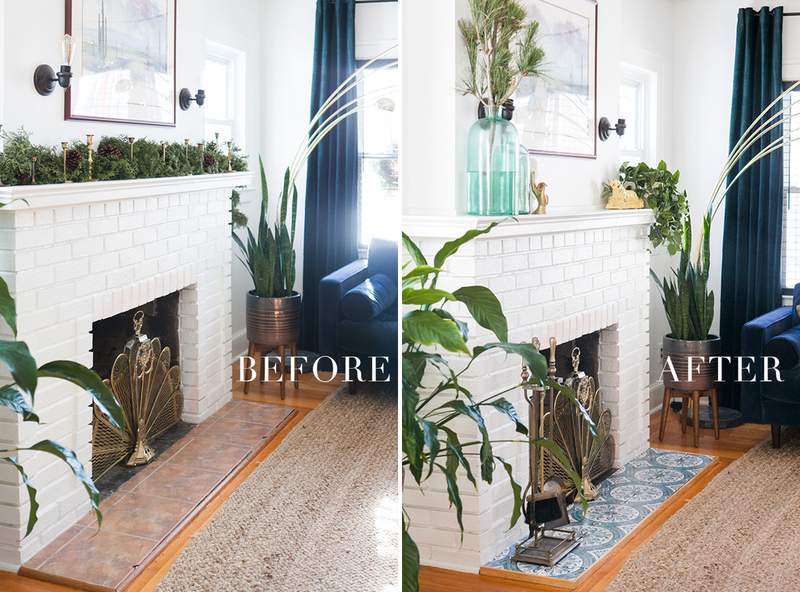 HOW DO YOU LIKE MY DIY FIREPLACE MAKEOVER?! Thank you so much, Mama!!! Thanks so much, Michelle! They really do. Highly recommended!! Love this project! I have a similar crime happening to my hearth! Would the tiles adhere to faux brick? Or do they need to applied to tile that’s the same size as tile decals?